This year, Colombia are sending their biggest ever delegation to the Olympic games with a total of 104 athletes. And for the first time, the number of female competitors outnumber the men in the squad. Wikipedia has a whole page dedicated to their presence this year so rather than pretending I've done loads of research on it, you can find the information here. The only thing I knew about Colombia before the challenge was that it's at the top end of South America, and they do a roaring trade in cocaine and excellent coffee. I have no personal experience of the former but am a huge advocate of the latter. So down to business. I got a little bit over-excited about this recipe. I began my quest for Colombian food on the internet and was looking for something vegetarian. I came back with several mushroom based dishes, all of which seemed disappointingly reminiscent of dishes that I'd associate with France. The one the husband would have liked most was simple garlic mushrooms. A five minute recipe that suggested it would be nice served with crusty bread. I duly Googled Columbian bread. Came back with Pan de Yuca. Didn't much pay attention to the ingredients list other than the need for Yuca flour (where on earth do you buy that in deepest Wiltshire?) and it was added to the list. Last night I had a quick pick from the list to see what I could make today without the need for the Ocado delivery and the Pan de Yuca seemed like the best choice. Google helpfully told me I could replace the Yuca flour with Tapioca or Corn Starch, Rice Flour or All Purpose (Plain) Flour. I settled for half plain, half rice. The required Queso Fresco I knew to be similar to Ricotta or Fromage Frais thanks to my love affair with my Thomasina Miers books. You can also substitute it with Feta but that seemed like too huge a risk to waste my favourite cheese on a recipe from the internet. It wasn't until I was mixing it up that I realised that it's actually the equivalent of an English scone rather than real bread. So much for crusty bread to go with my garlic mushrooms! The recipe uses baking powder for the rise and takes just ten minutes to cook the 'rolls'. Looking up other recipes whilst it was cooking, I discovered many recipes for it with combinations of mozarella or hard cheeses to give it a really cheesy taste. The resulting rolls had a crackle effect like you'd get on Tiger/Giraffe bread which comes from the use of rice flour. The bake was soft and light - slightly different in texture to my scones and they have this weird after texture in your mouth that you don't get from a regular wheat-based scone. 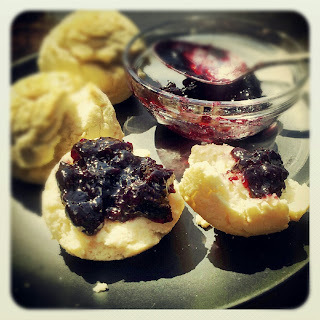 They're an excellent idea if your cooking for someone with a gluten intolerance but won't be making an appearance on my bake again list - not even slathered with piles of cherry jam as per the picture or packed full of real cheese. But if I ever happen across some Yuca flour, I might just be tempted to give it a go to see how a real authentic one tastes. And they might go down well with some of the aforementioned Colombian coffee - but it's a bit too hot for that today.